Over the past two years the Carnegie UK Trust’s Neighbourhood News initiative has supported five leading local news projects with £10,000 each to deliver community news in new and innovative ways. 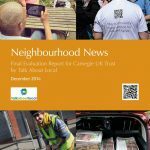 The Neighbourhood News Final Evaluation Report for the Carnegie UK Trust by Talk About Local draws on key findings from Neighbourhood News and sets out a new agenda for the future of local news in the UK. The report provides 11 recommendations for how government, regulators, funders and other local news providers can support community-led local news. The Carnegie UK Trust’s policy summary is also available here.